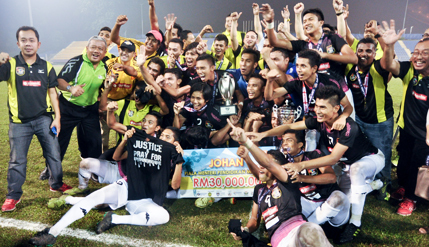 SHAH ALAM, SELANGOR, 9 October 2014 – The National University of Malaysia’s soccer team, UKMFC has successfully defended its championship status when it defeated UiTM (MARA University of Technology) Perlis 3-0 in the final here today for the 2014 Minister of Education trophy. UKMFC scored all its three goals in the second half although it almost took the lead several times during the first half of the knock-out competition for public higher education institutions, at the UiTM Shah Alam Stadium here. The goals were scored by Mohd Faiz, Mohd Helmi Hariri and Mohd Azri Ahmad. UKMFC coached by Sulaiman Hussin took home a cash prize of RM30,000. Among the many UKMFC supporters were the Deputy Vice-Chancellors Prof Dato’ Dr Mazlin Mokhtar, Prof Ir Dr Riza Atiq OK Rahmat Abdullah, Prof Datin Noor Aziah Mohd Awal, Prof Dr Imran Ho Abdullah and Dean of the Faculty of Science Prof Dr Sahrim Hj Ahmad. The match saw UKM constantly raiding the UiTM goal during the first half but could only find the target in the second half when it took a commanding three-goal lead that remained throughout the match. During the half-time interval, the Ministry of Education presented prizes to the winning teams of the 2014 regional League competitions. UiTM Sarawak emerged as the Borneo Division Champion with Universiti Putra Malaysia (UPM) Bintulu the runners up. In Division Two the Multimedia University (MMU) was the champion with Universiti Sultan Zainal Abidin (UniSZA) the runners-up. The International Islamic University (IIU) was the champion in Division Three. In Division One, UiTM Perlis emerged champions with UKM second and Kelantan Polytechnic third.